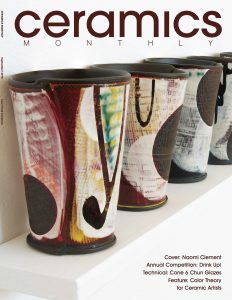 MFA 2017 Naomi Clement’s work is featured on the cover of Ceramics Monthly magazine’s September 2018 issue. 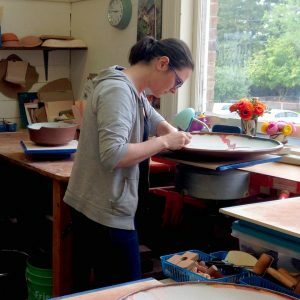 She won the Ceramics Monthly Emerging Artist Award in 2017, and recently debuted a solo exhibition in California. Naomi’s work was accepted to the annual “Drink Up!” ceramics contest, so she knew she would be included in the magazine’s September issue. Then she was contacted by Ceramics Monthly’s editor Jessica Knapp, and Naomi was thrilled to learn her work had been chosen for the magazine cover. 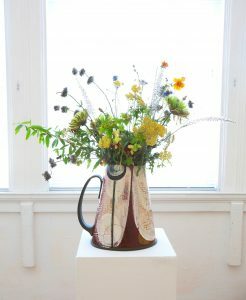 Her solo exhibition Bound was on display at Sonoma Ceramics’ Gallery 212 in Sonoma, California in June 2018. 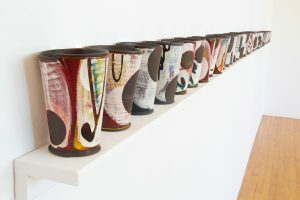 She created the series during her six-month artist’s residency in at Sonoma Ceramics center. The show itself was in many ways an extension of her MFA thesis show at LSU titled Trace, she explained. Bound features pots that represent nostalgia for her family, and hope for the future. Originally from Canada, she got her BFA from Nova Scotia College of Art & Design in Halifax in 2003. She worked as a Sales Associate at Barrel Select Wine Merchants and then as a marketing coordinator at a travel company in Toronto before she came to LSU as a graduate student. Ceramics always called to her. Life after LSU has been busy so far, she said. She spent last fall teaching at a college in Pennsylvania as a sabbatical replacement, before coming to Sonoma, California for the artist residency. (She previously did residencies at Arrowmont School of Crafts in Tennessee, Watershed Center for Ceramic Arts in Maine, and Medalta International Artist in Residence Program in Alberta, Canada.) Naomi recently moved back home to Canada and is working on setting up a studio there.